Groundwater and surface water account for respectively 51% and 49% of total water supply in Lebanon. 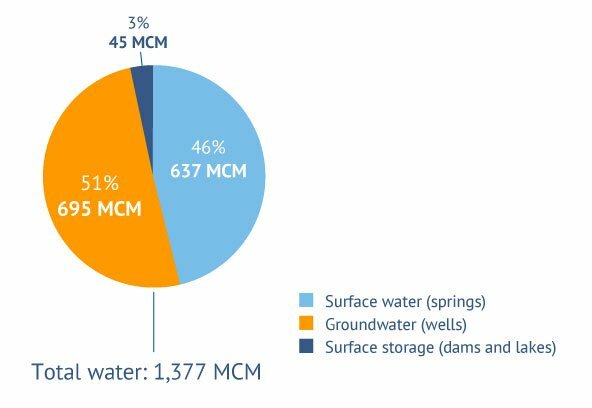 Most of the surface water supply originates from spring sources, with 637 MCM/yr currently exploited. Supply from surface water also comes from storage dams, namely the Qaraoun Dam and Chabrouh Dam, which currently provide a total of around 45 MCM/yr. Groundwater is exploited through governmental wells (around 650 wells yielding a total of 270 MCM/yr) to provide drinking water as well as private wells for drinking water and agriculture (more than 43,000 private wells with a total yield of more than 440 MCM/yr). Private wells include unlicensed wells, which are responsible for 28% of total groundwater abstraction. Figure 2 presents exploited water, i.e. the water that is supplied by source in 2010, with a total of 1,377 MCM. These estimates also reflect current conditions, since they represent the current water mobilized for supply. As for actual water use and demand from the different sectors, estimates vary. The Ministry of Energy and Water projected annual water demand for 2015 at 1,483 MCM, with around 60% allocated to agriculture, 30% to domestic use and 10% to the industrial sector. 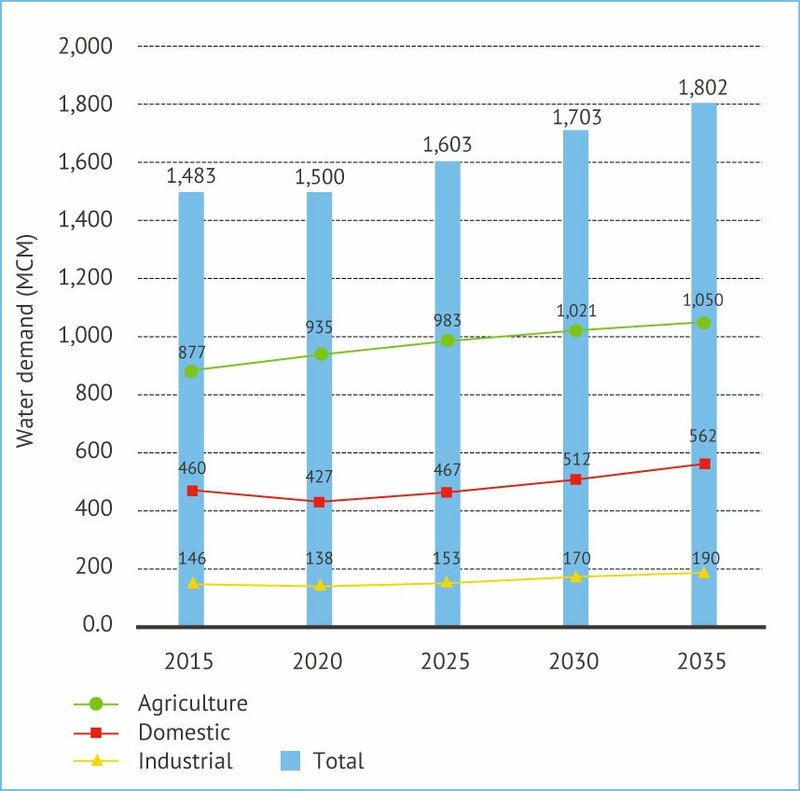 Figure 3 shows the projected water demand per sector until 2035. Other sources such as the World Bank (2010) project a much higher total demand reaching 2,055 MCM in 2020 and 2,818 MCM in 2030. These estimates highlight the imbalance between water supply and demand. Going forward, all projections point to severe water deficits within the next decade if no measures are taken to improve the quantity and efficiency of water supply and better manage demand (see also ‘Water Infrastructure’). These include increasing existing exploitable resources, increasing storage capacity through the construction of dams, reducing network losses and reducing demand through more efficient irrigation systems or household water use. It is important to mention that Lebanon regularly faces a seasonal water imbalance, with severe shortages during the dry season (between July and October). For instance, the drinking water supply in the Beirut-Mount Lebanon area is rationed, with around 13 hours of supply per day during the regular season to only three hours during the dry season. This seasonal imbalance is likely to lead to chronic water shortages by 2020. Periodic droughts, which occur every seven to ten years and can last more than three years, put further pressure on the water supply. During a severe drought in the winter of 2013-14, there was a 40-50% decrease in rainfall. Springs and wells ran dry, which had a severe impact on agricultural production and domestic water supply. The influx of Syrian refugees (not taken into account in these estimates) has placed further pressure on water resources. With water availability limited to 2,000 MCM/yr, chronic water shortages will occur in the near future unless measures are taken. However, less than 200 MCM is available in summer, according to MEW, 2010. Figures of yield from 2009, based on MEW, 2010. MEW, 2010. These estimates are based on a total population of 4.83 million in 2015, a total irrigation surface area of 105,000 ha consuming 8,600 m3/ha/yr and an urban water consumption of 174 L/person/day. The World Bank, 2010; El-Fadel et al. 2000. Ministry of the Environment and UNDP, 2011. Amery, 2003 in Geara et al., 2010. Farajalla, N., 2014; IRIN, 2014; The Daily Star, 2014.